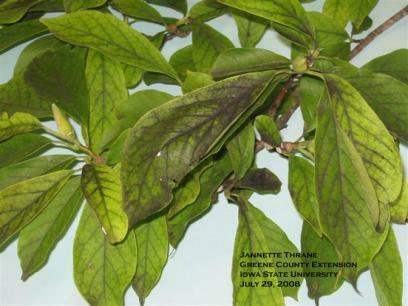 The magnolia scale is an occasional and widely scattered pest problem in Iowa on magnolia trees and shrubs. 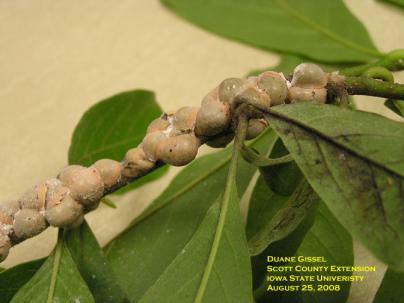 Scale insects feeding on the plant's sap can cause stunted growth, yellowish discoloration of the foliage, branch dieback, or death of the plant. Magnolia scales are one-half inch diameter, pink-orange to brown bumps on the undersides of the twigs. Magnolia scales become obvious in July when they produce large quantities of honeydew (sugary excretion). Honeydew makes the leaves shiny, and supports the growth of sooty mold, a fungus that causes the upper surface of leaves to turn black. Ants, wasps, flies, bees, and butterflies visit scale-infested plants to feed on the sweet honeydew. Honeydew makes a sticky mess on plants, vehicles, and patio furniture under the infested tree. Mechanical Control: Prune out severely infested branches. Because of their large size, female scales can be removed by hand on small shrubs. Wear rubber gloves and rub or brush scales from the plant in July when they are first noticed and before crawlers of the next generation emerge (early August). Be firm but gentle so as to not injure the bark. Biological Control: Several natural enemies help reduce scale populations, but are often insufficient to keep up with an outbreak population. Insecticides: Scale insects are difficult to control but carefully-timed treatments improve the success of management efforts. Repeated applications are usually necessary, and it may take two or more years to completely control a large population of these scale insects. When honeydew excretion is most obvious and annoying is usually not the best time to treat. label directions to apply the correct rate to avoid plant damage. Thorough and complete coverage is required for good control. Make at least two applications 7 to 10 days apart for best results. Additional natural and synthetic insecticides are labeled for use as sprays to control scale crawlers on landscape trees and shrubs. Because of toxicity, potential for drift and unintended damage to non-target organisms, professional application is recommended. SPRING. A dormant spray of horticultural oil (a special, highly refined petroleum product mixed with water and applied to infested plants) should be applied just before bud break in the late spring (late March to April). Thorough and complete coverage of stems and branches is required for the oil spray to suffocate the overwintering nymphs. A late spring insecticide application at the time the female scales are actively growing may help, but this must happen before the scales and honeydew become apparent to be effective.